Whilst retailers and manufacturers tend to be able to advertise their products, other businesses need to showcase the work that they have produced for previous clients. This has a wide range of benefits and will have a significant impact over whether prospective clients bring their business to you. An effective online portfolio is one of the best ways to demonstrate your credibility as a business. It shows that you are trustworthy and gives prospective clients an idea of the kind of work that you’ve done in the past. This also allows potential customers to approach your previous clients to get references and advice regarding the quality of your work. It also gives you an opportunity to showcase what you can do. 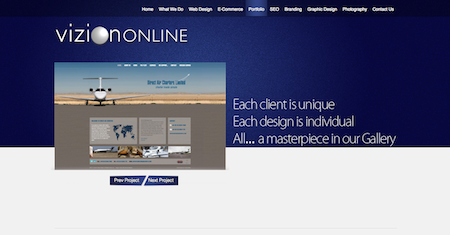 As a website design agency we have worked with hundreds of clients on a wide range of projects. It’s therefore very important to us that new clients understand the full range of services that we are able to offer, not to mention the skills and experience that we have demonstrated in the past. A portfolio can also help to indicate the kind of work that you are hoping to do in the future. It might be, for example, that you are hoping to attract a particular kind of clientele in the future as you start to become increasingly specialist. This is where developing an online portfolio that helps you grow your business is particularly key, because it helps you to set the direction of future projects. Your portfolio is your opportunity to present yourself in the way that you want to. This can be achieved in a subtle and persuasive way. An effective portfolio can also help you to showcase the breadth of services that you offer. It might be, for example, that you are well-known in your industry or region for a particular service that you have been successfully providing for a number of years. However, prospective clients might not be aware of the full breadth of skills and experience that you are able to bring. It’s also a great way to show that you have a great reputation in a particular sector, which may help you to break into a new or emerging sector. How then do you actually go about developing an online portfolio that helps you grow your business? We recommend that you produce a visual, extensive portfolio which includes as many photos, images and logos as possible. This will make it very easy for the prospective customer to see what you’ve produced. It is your chance to impress them. It’s also important to underline your qualifications and professional accreditation or affiliation, not to mention any awards or prizes that you have won. This will help to underline the quality of service that you have to offer. Finally, feedback from previous clients is a very powerful way of gaining the trust of prospective clients.